The amount of heat produced in the windings and connections. The amount of heat produced in the iron core. How effectively the heat can be removed from the transformer when the thermal rating of the transformer is reached. At this point, the heat being produced must equal the heat being removed or dissipated – thermal equilibrium. 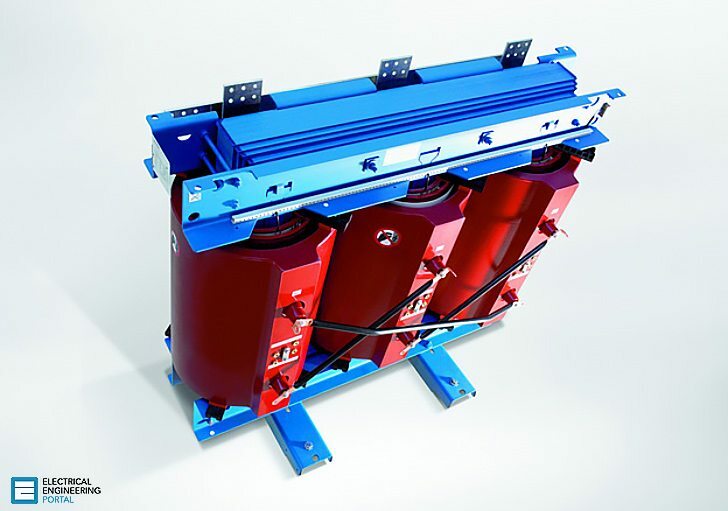 The efficiency of power transformers is high, especially, for large transformers at full load. However, losses are present in all transformers. These losses may be classified as copper or I2R losses and core or iron losses. Copper losses are resistive and proportional to load current and are sometimes called “load losses” or “I2R losses“. As the transformer is loaded, heat is produced in the primary and secondary windings and connections due to I2R. At low loads, the quantity of heat produced will be small but as load increases, the amount of heat produced becomes significant. At full load, the windings will be operating at or near their design temperature. Figure 1 shows the relationship between load-current and the heat produced in transformer windings and connections. The iron loss is due to stray eddy currents formed in the transformer core. Lines of flux are formed around the current-carrying conductors. The majority of the flux is as indicated in the following Figure 2, flowing around the core. Some of the flux however, will try to flow at angles to the core and will cause eddy currents to be set up in the core itself. The term eddy is used because it is aside from the main flow. To combat this effect, the core is laminated as illustrated in Figure 3. The laminations provide small gaps between the plates. As it is easier for magnetic flux to flow through iron than air or oil, stray flux that can cause core losses is minimized. The term eddy is used because it is aside from the main flow. To combat this effect, the core is laminated as illustrated inFigure 3. The laminations provide small gaps between the plates. As it is easier for magnetic flux to flow through iron than air or oil, stray flux that can cause core losses is minimized. What is the copper loss of 750kVa, 3ph, power transformer. How to compute? We have 8 Dry Transformers 1600 KVA on KTT project. Please inform us about how many WATT or BTU/hr heat gain predused from those for HVAC cooling room design. my question is power loss in a transformer due to heat production is called what???? Copper (I2R) losses and core(iron) losses.